Vivian Claire Liew – named Young Global Leader 2015 by the World Economic Forum – has been living her calling to serve Asia’s poor and neglected. Since founding PhilanthropyWorks 7 years ago, she has been the trusted advisor to select rainmakers, forging sustainable development and transformational philanthropy strategies by addressing key societal gaps with strategic insights and implementation Asia-wide in locales like Pakistan. Vivian is sought after as a thought leader and an expert practitioner, featuring on CNBC and Singapore’s Business Times among others. Institutions such as Insead and Singapore Management University have invited her to be guest lecturer, and she also addresses the clients of leading private banks. Select speaking engagements range from “Building resilient societies” at the Asian Forum on Corporate Social Responsibility, “Intelligent CSR” at the Asean 100 Leadership Forum, “The science of philanthropy” at the Asian Family Business Forum, “Impact evaluation and social entrepreneurship” at the Harvard Social Enterprise Conference, and “Be the change you want” at TEDx. Vivian’s board service has encompassed both the local and the global. She is the 1st Asian board director elected to Nobel-winner Medecins sans Frontieres (Brussels), and similarly, now serves Singapore via the Securities Investors Association. Her leadership is honoured by the Asean 100 Leadership Forum, Asia Society etc. 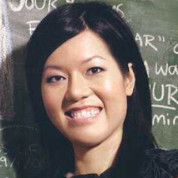 She is also one of Singapore’s 50 most inspiring women and 40 under 40. Graduating from the University of Pennsylvania’s Huntsman Program with dual honours degrees (Wharton & College) in 3 years, Vivian was chosen to launch The World Bank’s Junior Associate Program as their first professional hire direct from undergraduate school. Serving in the Public Sector Anchor in their Washington DC headquarters, she was promoted after four months. She then worked in Corporate Finance at Goldman Sachs in Hong Kong, volunteered with MSF as their financial controller in Liberia, and served as the business manager to the UBS Singapore Country Head and concurrently the wealth management head, before founding PhilanthropyWorks. "Education is vital in our world. And teachers - with parents, albeit those who have the luxury of time to journey with their children - are the giants on whose shoulders students stand on, to learn from the treasury of humanity’s knowledge, and to actualize our dreams for a better future. Teachers matter immensely. Yet they have long toiled in the background. Let us bring forth the gratitude in our hearts, and honour them!"